Jupiter looks a bit different in infrared light. To better understand Jupiter‘s cloud motions and to help NASA’s robotic Juno spacecraft understand the Hubble Space Telescope is being directed to regularly image the entire Jovian giant. The colors of Jupiter being monitored go beyond the normal human visual range to include both ultraviolet and infrared light. Featured here in 2016, three bands of near-infrared light have been digitally reassigned into a mapped color image. 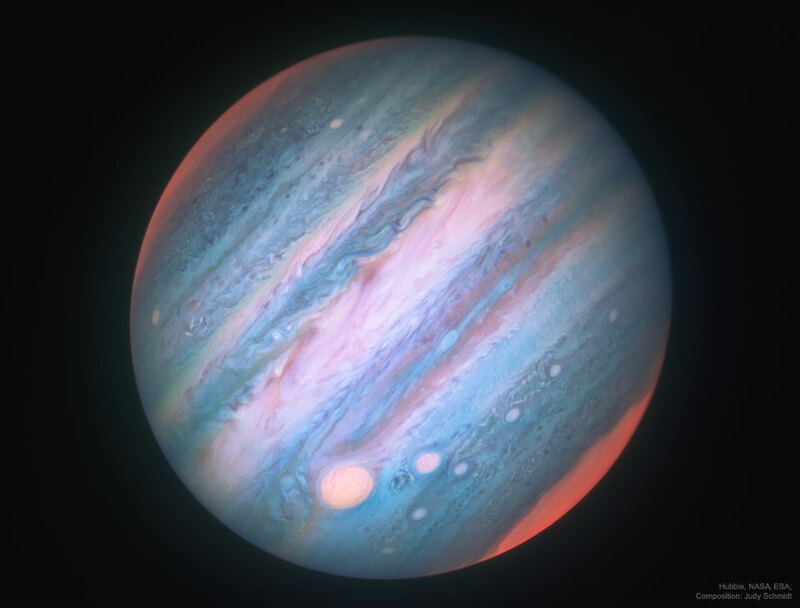 Jupiter appears different in infrared partly because the amount of sunlight reflected back is distinct, giving differing cloud heights and latitudes discrepant brightnesess. Nevertheless, many familiar features on Jupiter remain, including the light zones and dark belts that circle the planet near the equator, the Great Red Spot on the lower left, and the string-of-pearls storm systems south of the Great Red Spot. The poles glow because high altitute haze there is energized by charged particles from Jupiter’s magnetosphere. Juno has now completed 10 of 12 planned science orbits of Jupiter and continues to record data that are helping humanity to understand not only Jupiter’s weather but what lies beneath Jupiter’s thick clouds. Posted on Wednesday, 21 February 2018 by VGC	This entry was posted in ifttt-photograph and tagged IFTTT, NASA. Bookmark the permalink.